A bit sooner than anticipated (prompted by a comment from a reader), here’s the next edition of my Half-baked Blueprint series. 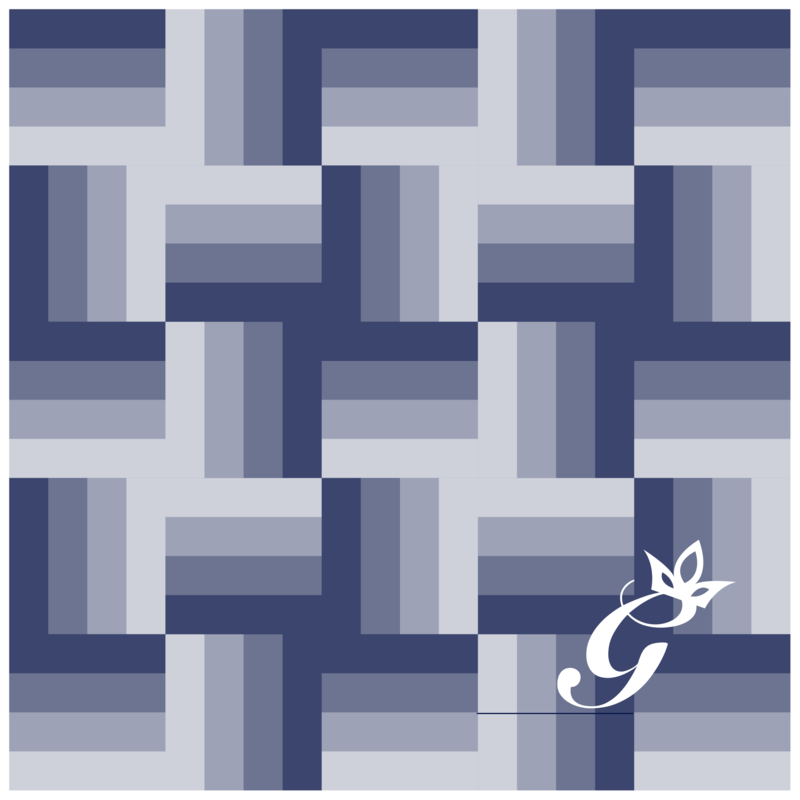 Remember, these are not patterns; think of them as rough outlines of the inspiration, math, fabric, and techniques I use in some of my quilts—there’s a lot you’ll have to fill in yourself. My hope is that it will inspire other quilters to play with quilt top designing rather than always reaching for published patterns. 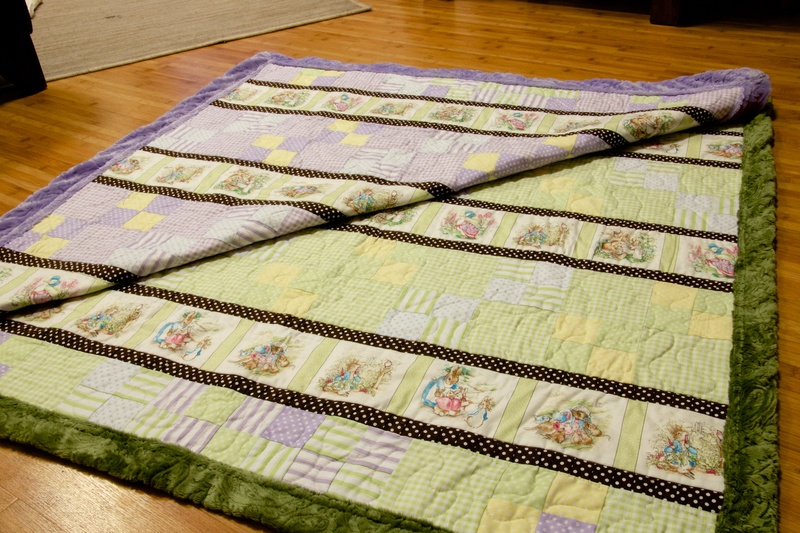 Three years ago, I pieced the Lollipop Baby Quilt quilt improvisationally, initially aiming at creating a straight-forward Jelly Roll Race quilt (albeit with a strange non-standard roll of half-strips). Halfway through, I paused to do a few quick math calculations and chose to piece it in four sections. All of your strips are between 40-44″ long, with the selvages removed. 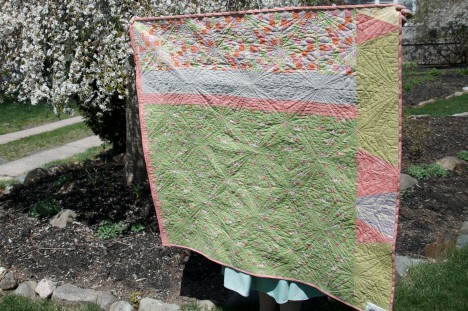 You’re piecing straight across the strips, not diagonally as in some Jelly Roll Race quilts. If you want to piece the strips diagonally, you’ll need three (3) extra strips, 23 total. You’re sewing the strips together with an exact 1/4″ seam allowance. 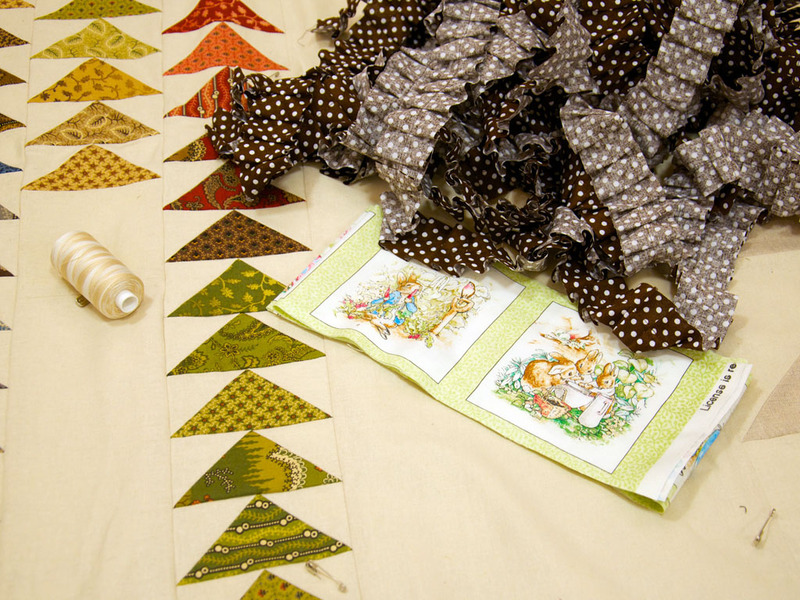 Jelly Roll Race quilt measurements are inexact by nature—the whole point is to just sew everything together and square it up at the end, if needed. 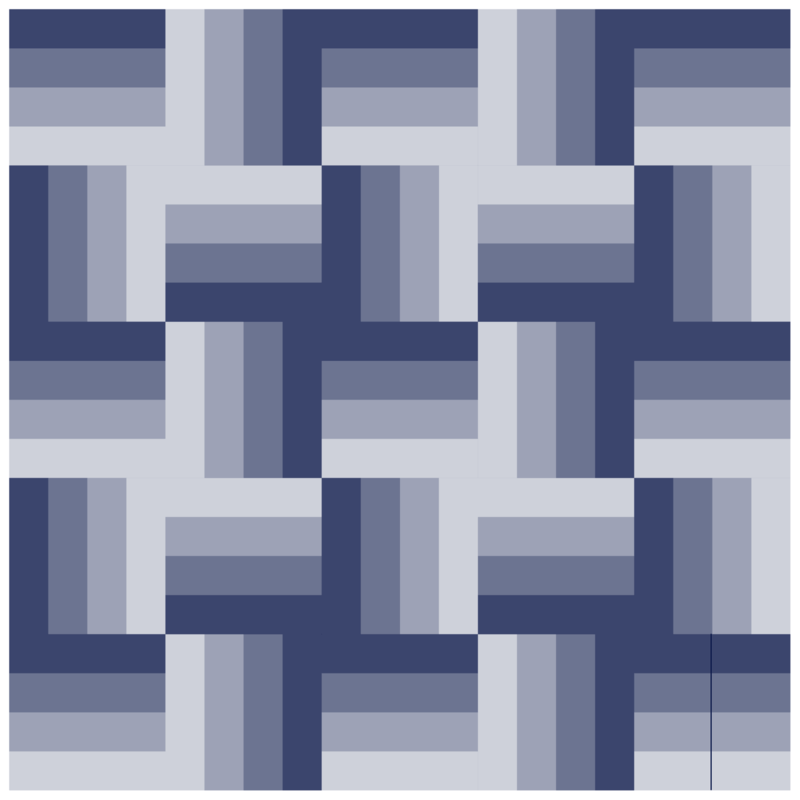 Piecing blocks is largely the opposite—you need relatively precise measurements so that everything joins up correctly. To mesh the two, you need to be willing to deal with both. 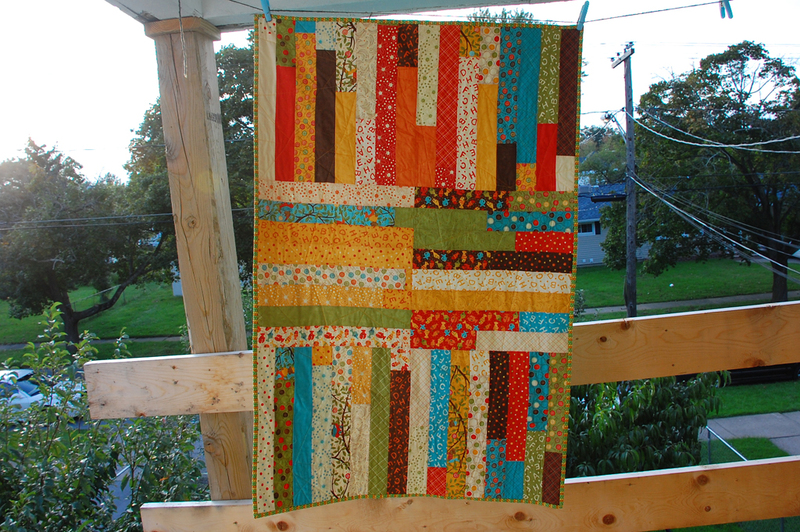 This is just basic Jelly Roll Race quilt making, but you stop mid-way through. Sew all 20 strips together, end to end. You should have a strip that is at least 800″ long. If it is shorter, you need to add one more strip. If it is longer, that’s great. Most of the time, it should end up around 820″ long at this point. Cut exactly in half, then sew the two strips together along the long side. Now, you should have something that is 4.5″ x 400″ or longer. Square up the ragged end if needed, but try to not cut off too much. Cut in half, sew along the long side, result should be 8.5″ x 200″ or longer (4 strips tall). Square ends if needed. Once more. 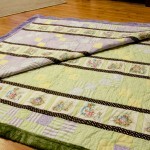 Cut in half, sew, result should be 16.5″ x 100″ or longer (8 strips tall). Square ends if needed. The finished quilt is just 6 squares cut from your strip set. 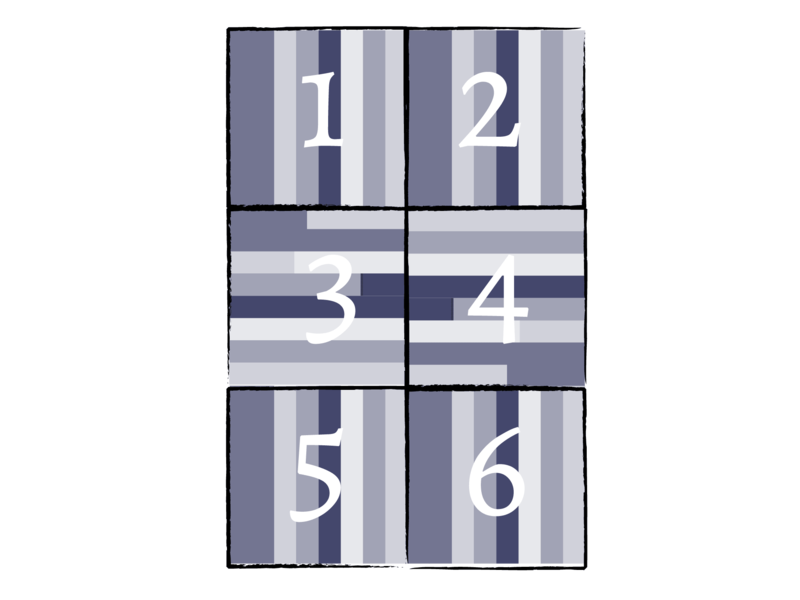 Cut six 16.5″ blocks off (you should have a few inches leftover—discard it, use it on the back, or in a different project), then sew the blocks together in three rows, where rows one and three have stripes vertically, row two has them horizontally. You now have a completed quilt top. A whole standard jelly roll can make a 48″x64″ quilt. You’ll use 40 strips. You’ll start with a pieced strip 1600″ or more long. Your finished strip set will still be 8 strips tall (16.5″), but 200″ or longer, and you’ll cut 12 squares. Just remember, not all rolls have the same number of strips, and you’ll need more strips than a standard jelly roll if you piece diagonally (46 strips total). Rather than cut six blocks, you can cut two off of your strip set for the middle row, then sew the remaining length into a 16-strip-wide strip set and cut that in half for rows 1 and 3—this is a little less exact, but will let you use up the full length rather than discarding the remaining few inches leftover after cutting blocks. Doing it that way likely accounts for the longer length of my quilt. 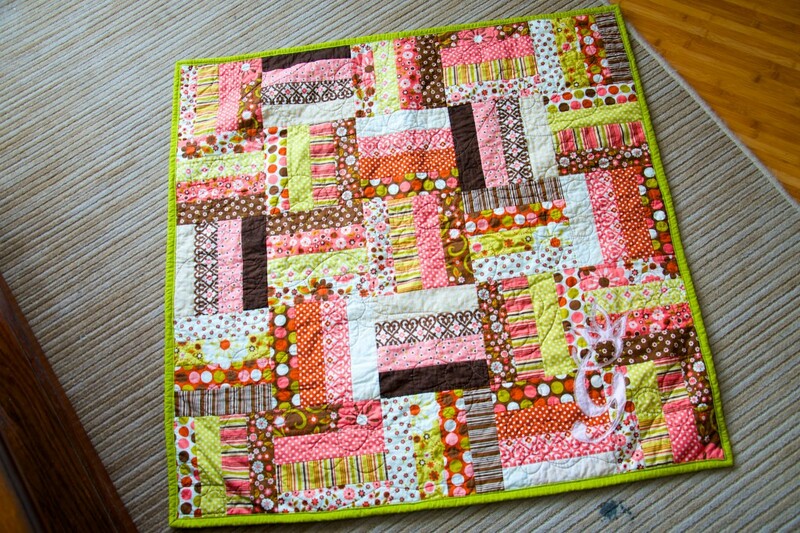 “Lollipop Baby Quilt”, Rachael Arnold, September 2011. 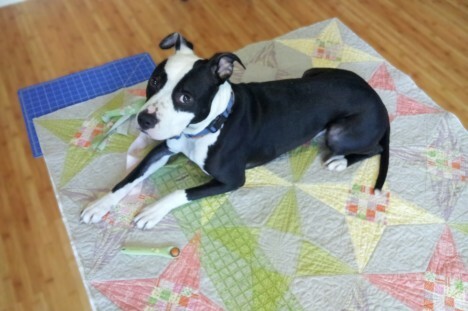 Good luck with your own quilt-making! 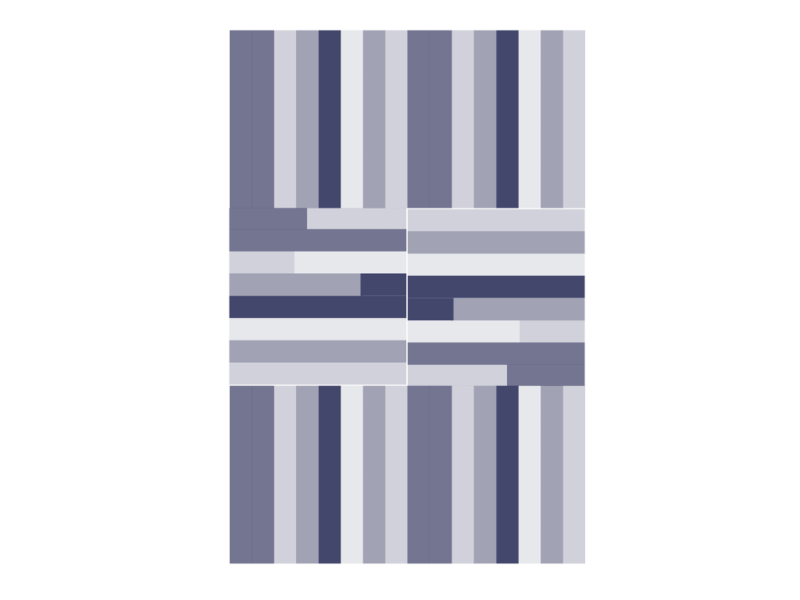 Caveat: I donated the quilt to the Linus Project a few months after finishing it in 2011, so I’m working partially from memory/partially by working out the math and logic again in 2014. 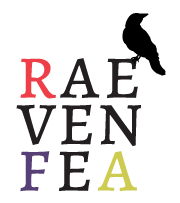 The latter has some contradictions to the original post, such as the finished size. I claimed that the original quilt is ~36″ × 51″, but my current math concludes that it should be 32″ × 48″. My best explanation is that I must have (really) sloppily measured the unwashed, finished quilt and rounded up. I feel confident that the new measurements are correct (plus or minus an inch or two to account for piecing/cutting/shrinking deviations). It’s been a long time since I followed a quilt pattern. 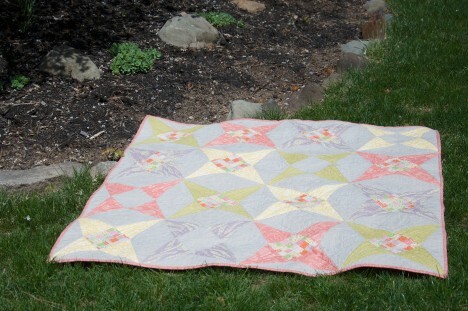 The last twenty quilts I’ve made have been largely or completely my own designs, or my own take on something I’ve seen. The hardest technical part is doing the math and figuring out if I have the right amount of fabric for what I’ve chosen to do, but simply believing that I don’t need a pattern was a huge initial hurdle. Remembering that hurdle, I’m starting this Half-baked Blueprint series. They’re not patterns; think of them as rough outlines of the inspiration, math, fabric, and techniques I use in some of my quilts—there’s a lot you’ll have to fill in yourself. 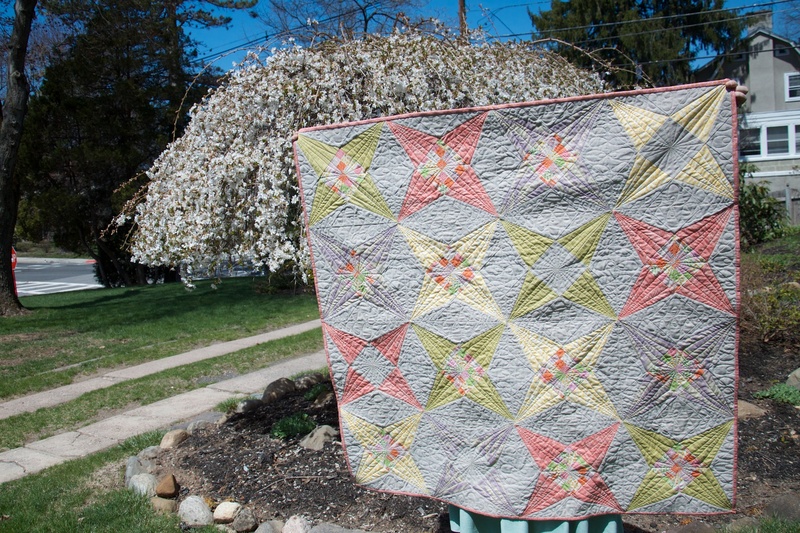 The rail fence “Noble Blooms” quilt from earlier this year is a good place to start. My hope is that it will inspire other quilters to play with quilt top designing rather than always reaching for published patterns. Cut four 8.5” blocks from each strip set, totaling 24 blocks. Then, cut a 4.5” x 8.5” section off two of the strip sets and sew those together to create one more 8.5” block. 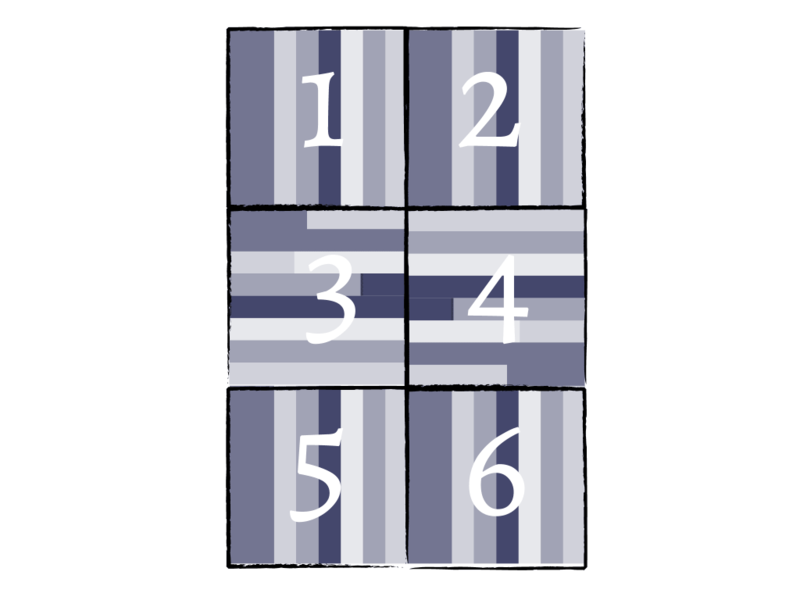 Alternative: if your strips have 42.5″ of usable width (after you remove selvages), you can get all 25 blocks from only 20 strips—5 blocks per strip set, and no pieced extra block. Some strips will have this width, others won’t; each manufacturer, fabric line, and even bolt varies on the total width of fabric. 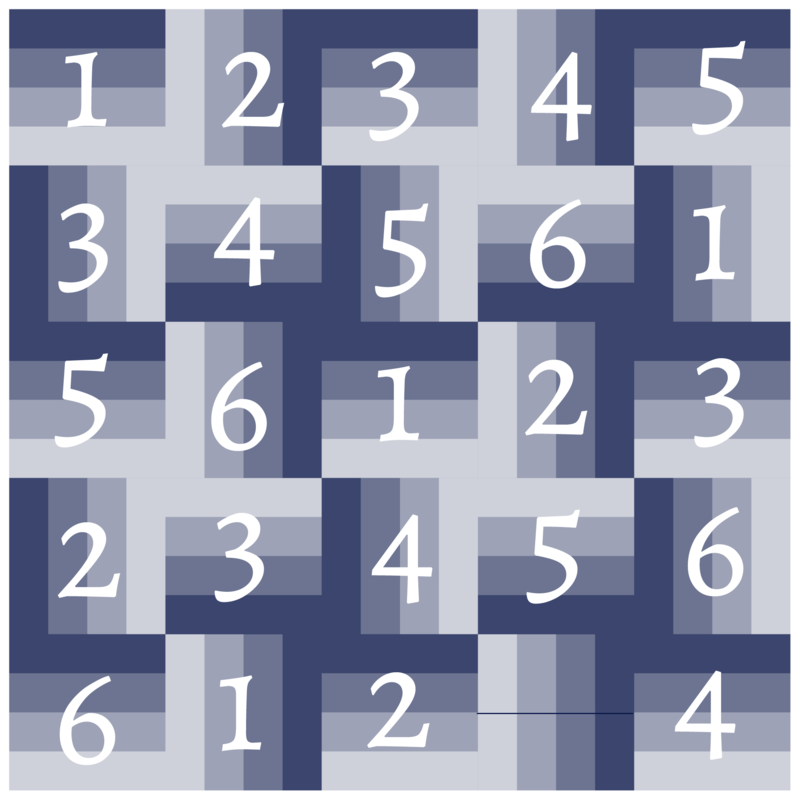 Basic: Five rows of five blocks each, alternating the direction of each block. 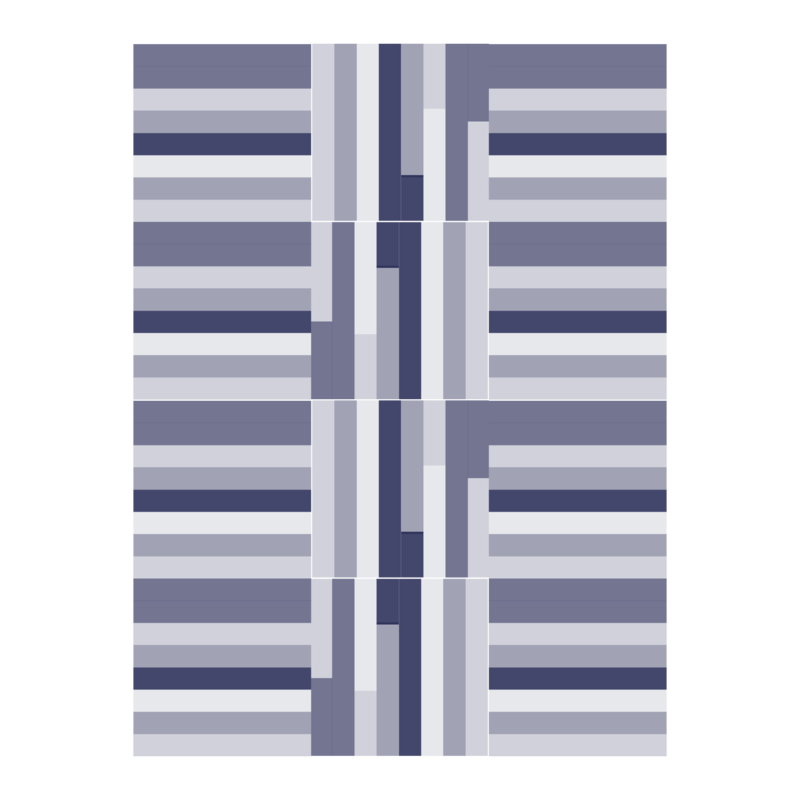 Intermediate: use values of the strips within blocks to create secondary patterns (sketch it before piecing or use a design wall). Advanced: solve the n-queens problem with your placement like I did to please my nerdy mind (no block is on the same horizontal, vertical, or diagonal as another of the same block set). What caused me to make the choices in my own quilt? In this case, form followed supplies and time. I had a Rolie Polie of 23 2.5″ strips, a 54″ square piece of Minky, a stash to draw from for binding, but nothing much that coordinated with the Rolie Polie otherwise. And, I had about a week and a half to make the quilt. Rail fence blocks can be arranged in any number of ways. 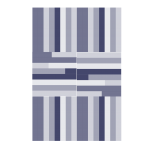 Since I had four distinct color and value groups (brown, pink, green, beige) with an equal number of strips in the roll (more or less), I was inspired to make all of my strip-sets with one strip of each from darkest to light. Because I could only cut four blocks from each strip set, I had to add one additional strip from my stash to the Rolie Polie, and piece a block together from two half blocks to make 25. As I mentioned above, the layout of blocks was mostly to appease my problem-solving mind (although I deviated with the planned layout for the half-and-half block and another spot where I flipped a block when sewing rows and didn’t want to rip). I wanted to personalize it, since the recipient’s sibling’s quilt had her initials in the quilting, so I chose to applique her first initial and a crown (playing off the meaning of her name) in one corner, using one of the few FQs in my stash that matched the other fabrics. You can download a printable version for your own project (if you want a curly, be-crowned ‘G’). 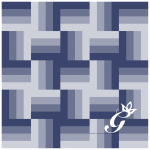 Quilting possibilities are only limited by your imagination. I used a large-scale, all-over flowery free motion motif based on the flowers in the fabric for two reasons: it could be done quickly, and was a good project for me to play with free-motion on. I chose to use a cream-to-brown variegated thread because it was the best match in my stash, but also because it blended the quilting into the varied colors of the fabrics. Because I worked with 2.5″ strips, the math on this was simple. But, that didn’t mean everything went to plan. I didn’t measure the width of the strips, so I couldn’t cut my planned five blocks from each strip set and had to improvise by finding a 24th strip (actually, two 21″ strips from a fat quarter) and piecing a block together from the leftovers of other strips sets. Sure, it meant reevaluating the block layout I’d planned initially (as well as choice of binding, as I’d planned to use the leftover strips and that fat quarter as the binding), but in the end, I am pleased with the final quilt (and, I like the solid binding far more than I think I would have liked the original plan). In the blueprint above, I went with the assumption that you might also run into this issue. “Noble Blooms”, Rachael Arnold, February 2014, 40″x40″. Photo by Carl Pfranger. 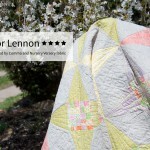 My very oldest (and dear) friend’s three-year-old son is my most dedicated fan (of the quilts, at least). I’ve mentioned the love he’s given the quilt I made for his birth quite a few times on here. While his newborn sister can’t bear the distinction of receiving the first quilt I ever made, I wanted it to be special too—so, she’s receiving the first quilt I’ve made with Kokka fabric. Okay, maybe that doesn’t sound special to you, but I’ve lusted after many Kokka fabrics and this quilt finally convinced me to buy some. “Stars for Lennon”, Rachael Arnold, March/April 2014, 48″x48″. Photo by Carl Pfranger. It all started with an FQ of Nursery Versery, but in the final top there’s only one print from that set (the patchwork print). The back is pieced, and includes a big chunk of the mouse print from that line. The stuffed giraffe and doll quilt that I gifted at her shower were also made with those prints. “Stars for Lennon” (back), Rachael Arnold, March/April 2014, 48″x48″. Please forgive the half-basted binding. When I was shopping around (there are two shops around here that carried the line! ), I fell in love with the design of a print in Comma that was conveniently placed next to Nursery Versery on the shelf. However, I couldn’t figure out how to turn that layout into a quilt top using the prints I’d purchased in the Kokka FQ. So, I pulled more prints from the shop in a complementary color scheme. Those ended up comprising the top of the quilt, paired with Essex Linen. I drew up the 12″ block in Illustrator, then printed it and created templates. Another first: I’ve never made a whole quilt top that required templates to piece the blocks. My technique leaves much to be desired—there are more lost points than there are good ones and the whole top was a little wobbly before quilting. But, I’m happy with the final outcome even if it has flaws. 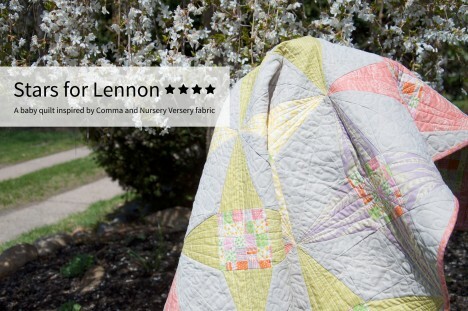 “Stars for Lennon” (label), Rachael Arnold, March/April 2014, 48″x48″. Photo by Carl Pfranger. I planned to do an all-over swirl like I did on the coordinating doll quilt, but had to work around a broken FMQ foot. Limited to my walking foot and a floating embroidery foot (which worked better than expected), I let the quilt talk to me and it turned out even better than I expected. Pellon Nature’s Touch batting gives it a good weight and drape. “Stars for Lennon” (quilting detail), Rachael Arnold, March/April 2014, 48″x48″. Photo by Carl Pfranger. 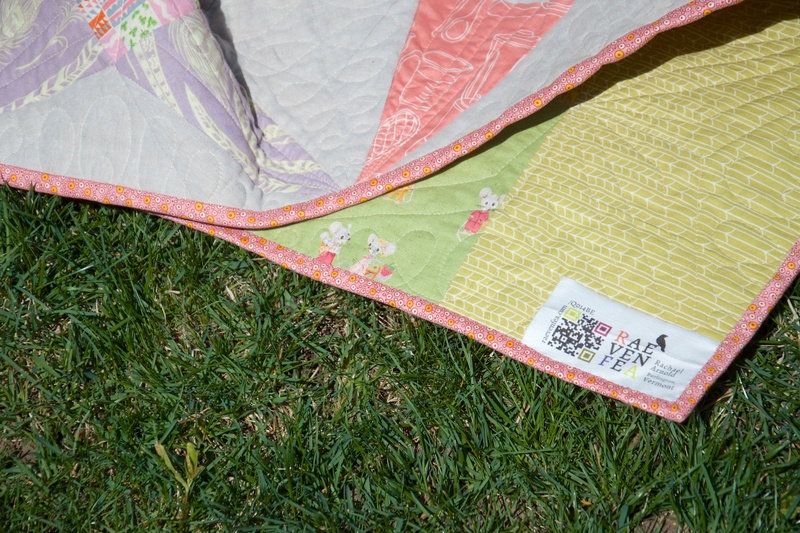 The 48″ square quilt is bound in a Denyse Schmidt print and topped off with a label. I hope she loves it as much as her brother loves his. “Stars for Lennon” (detail), Rachael Arnold, March/April 2014, 48″x48″. If she doesn’t love it (and if her brother doesn’t steal it), Moof is always willing to take it back. 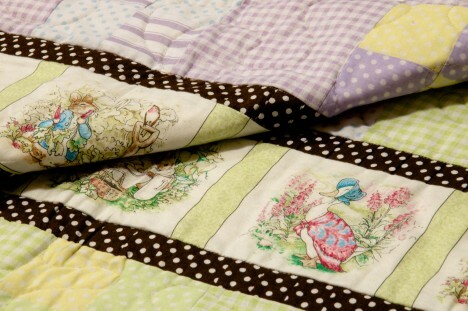 When one must make two quilts in the same approximate timeframe as typically takes one, simplicity is key. At least, this is what I kept reminding myself when I felt that the basic layout I’d planned for these two quilts was too plain. I worked a bit outside of my comfort zone in terms of palette and style, but the parents chose to go with a Peter Rabbit theme for their nursery, and once I found a Beatrix Potter panel for sale, it seemed like a good idea to go with it. While basic, it’s also a more traditional layout than I’m used to. 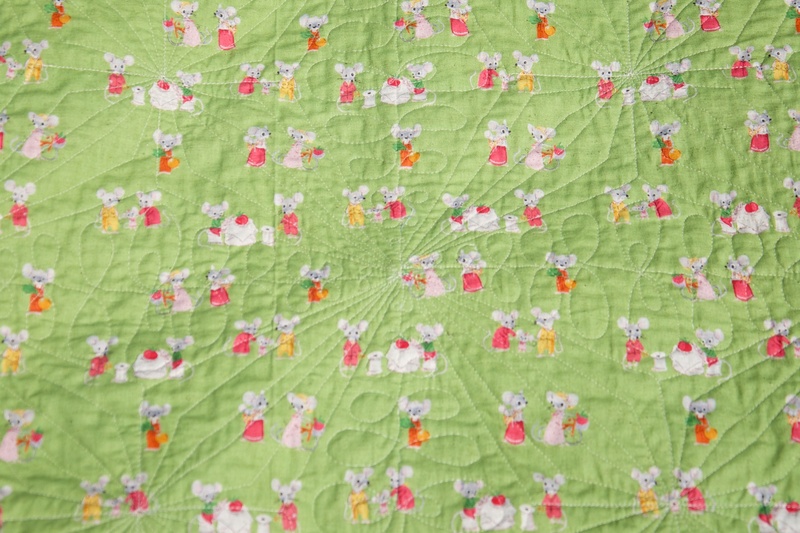 Once upon a time there were two little Peter Rabbit quilts, and their names were—”Mopsy Green” and “Flopsy Purple” (details), both 43″x43″, Rachael Arnold, January 2014. Of course, I couldn’t restrain myself and keep it entirely simple; it’s hard to tell in the photographs, but the brown strips surrounding the panel strips are gathered, giving them a bit of texture. It may have been better to make them wider (so it was more obvious), but I was limited in the amount of fabric I had to work with. That, actually, explains many of the design choices. 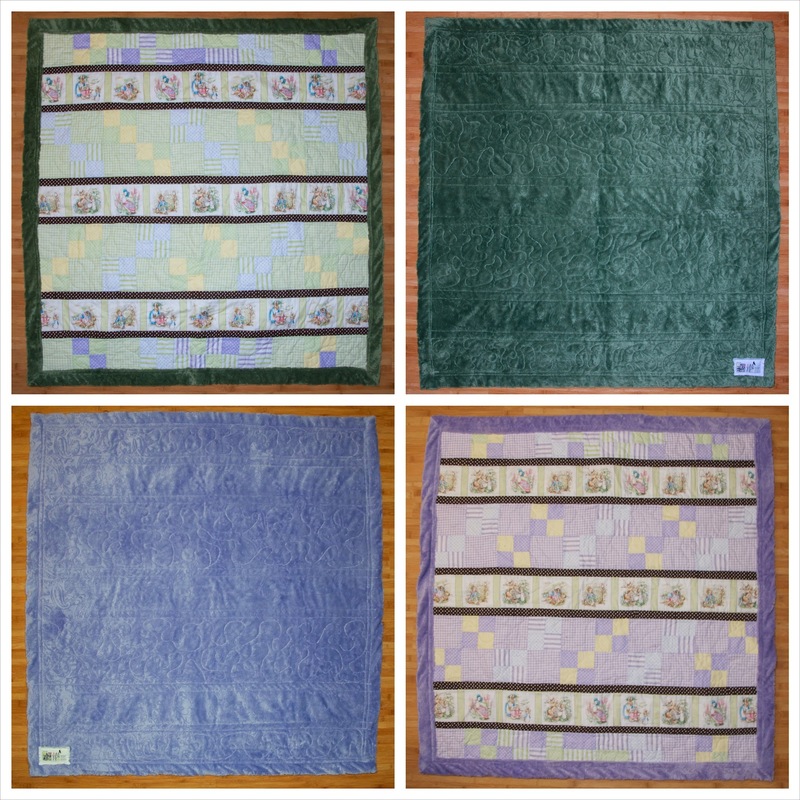 I fabric shopped before deciding on the design (or perhaps you could say that I changed the design after fabric shopping), so there was a lot of give and take when I went to create the quilts. “Mopsy Green” and “Flopsy Purple” (details), both 43″x43″, Rachael Arnold, January 2014. The quilts are backed in paisley Minky, and have a layer of low-loft 80/20 batting inside (from stash scraps, so I’m not positive about the brand). The quilting is very basic—stitches in the ditches for the panel and brown strips, simple meander on the block sections—in a poly/cotton beige Gutermann thread. I am always amazed at how fast free-motion quilting goes; it took about the same amount of time to do all of the FMQ as it did the 12 straight lines across each quilt. “Mopsy Green”, “Flopsy Purple”, both 43″x43″, Rachael Arnold, January 2014. Due in part to my aforementioned fabric conundrums and a desire to make the quilts ever a bit larger, I decided to try out a new binding technique and use the backing as self-binding. By cutting the batting 3.5″ larger than the top, I was able to support a thicker binding and gain an extra 1.75″ on each side of the quilt. Plus, it gives the front even more texture. The somewhat sparse quilting density kept the batting from shrinking all that much, and everything went together pretty well. 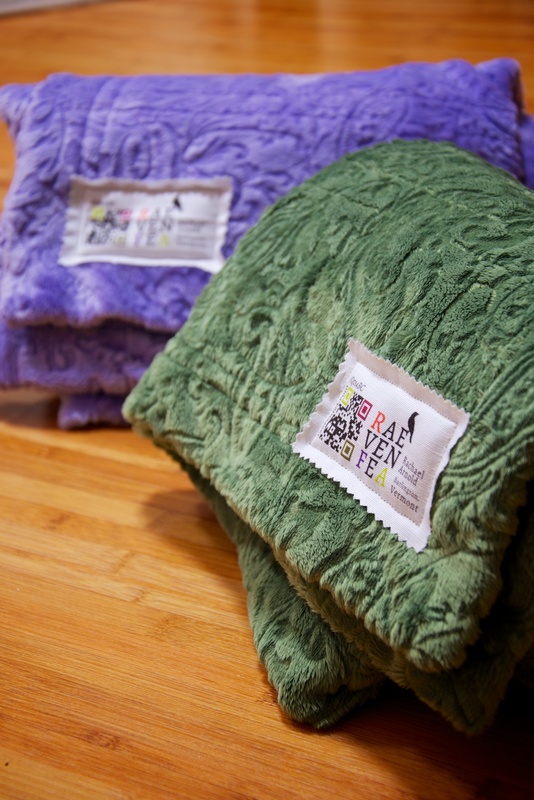 “Mopsy Green” and “Flopsy Purple” (back details), both 43″x43″, Rachael Arnold, January 2014. The two quilts have been shipped off to the twins, who were born in December. I hope they don’t get into too much mischief for now, but I bet their parents will be kept quite busy! 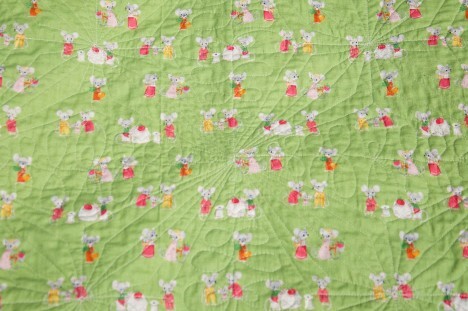 Now off to get in more mischief myself, as I have another baby quilt to finish by next Friday. A bit of modern design executed in linen and reproduction fabric (Metropolitan Fair by Barbara Brackman) is basted and ready to quilt, while 27 (!) 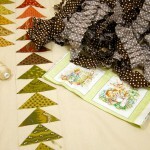 yards of ruffles and Peter Rabbit fabric wait to become two quilts for twins. Deadline: mid-December.